The next Poetry and Prose Open Mic session will be held on Friday, April 26, 2019 from 12 – 2 p.m. at the Courtenay Regional Library in the Events Room. Come to read or to listen. Everyone is welcome. Hosted by the Comox Valley Writers Society. The next monthly meeting of the Comox Valley Writers Society is on Thursday, April 18, 2019 in the library at Mark R. Isfeld Secondary School, 1551 Lerwick Rd, Courtenay. Everyone is welcome. Meeting begins at 7 p.m. Please wear a name tag so we can get to know each other’s names! Where: Courtenay Regional Library; 600 6th St.
CVWS members Joline Martin, Jane Wilde and Carolyn Walton will be speaking on the topic of memoirs at the Courtenay Treasure Story Hour. Everyone is welcome. The McLoughlin Gardens Society will present a screening of “The Gardener” on Thursday, April 4th at 7 p.m. in the Stan Hagen Theatre, NIC Courtenay campus. The Gardener is a film that reflects upon the meaning of gardening and its impact on our lives. Shortly before his passing at the age of 86, influential gardener and plantsman Frank Cabot recounts his personal quest for perfection at Les Quatre Vents, his twenty-acre English style garden and summer estate that was opened to a film crew for the first time ever in 2009. Nestled amongst the rolling hills of the Charlevoix County in Quebec, Les Quatre Vents has become one of the world’s foremost private gardens. Created over 75 years and three generations, it is an enchanted place of beauty and surprise, a horticultural masterpiece of the 21st century. Through the words of Cabot and his family, and with the participation of gardening experts and writers, the film looks back at this remarkable man’s personal story and the artistic philosophy that gave birth to one of the greatest gardens in the world. Action. Catherine is relatively new to the Comox Valley and comes from a community newspaper background. She will present a current Tide Change project that will be of interest to writers of all genres. Join us on Thursday, March 21, 2019 in the library at Mark R. Isfeld Secondary School, 1551 Lerwick Rd, Courtenay. And please wear a name tag so we can get to know each other’s names! A day-long retreat with Marie Maccagno. Time: 10:30 a.m. Refreshments will be served. Michael Nicoll Yahgulanaas is an award-winning visual contemporary artist, author and professional speaker. His work has been seen in public spaces, museums, galleries and private collections across the globe. Institutional collections include the British Museum, Metropolitan Museum of Art, Seattle Art Museum and Vancouver Art Gallery. His large sculptural works are part of the public art collection of the Vancouver International Airport, City of Vancouver, City of Kamloops and University of British Columbia. Yahgulanaas’s publications include national bestsellers Flight of the Hummingbird and RED, a Haida Manga. When not writing or producing art, Yahgulanaas pulls from his 20 years of political experience in the Council of the Haida Nation and travels the world speaking to businesses, institutions and communities about social justice, community building, communication and change management. His most recent talks include the American Museum of Natural History and TEDxVancouver. 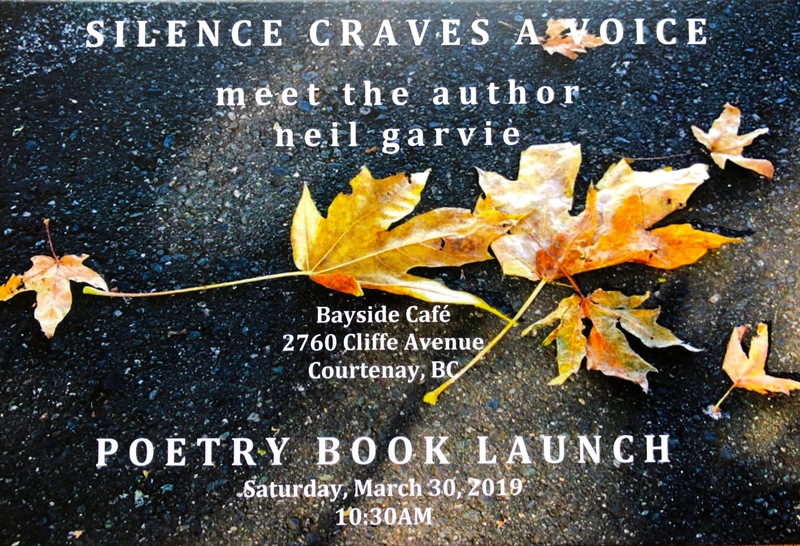 The next Poetry and Prose Open Mic session will be held on Friday, March 29, 2019 from 12 – 2 p.m. at the Courtenay Regional Library in the Events Room.